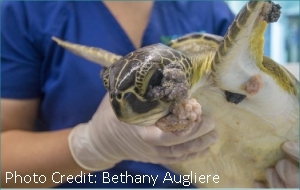 Summary: Fibropapillomatosis (FP) is an infectious, neoplastic disease that affects all hard-shelled marine turtle species, and has been reported in all oceans. FP tumors are characterized by cutaneous, ocular, and visceral growths and often debilitate affected animals by inhibiting feeding and movement, obscuring vision, and/or leading to organ failure. Over the past three decades, FP has emerged as an important disease in green turtles (Chelonia mydas), and also affects loggerhead turtles (Caretta caretta). In marine turtle rehabilitation facilities, FP is a key concern, and sometimes develops after turtles are admitted for other reasons. Chelonid herpesvirus 5 (ChHV5) is a herpesvirus that has been consistently identified in FP tumors via molecular tests. The proposed research aims to elucidate aspects of ChHV5 pathobiology in sea turtles with and without clinical signs of disease (FP tumors). The objectives of this study are threefold: (1) evaluate FP tumor score and regrowth in rehabilitating sea turtles and to develop prognostic indicators of rehabilitation outcomes based on these factors; (2) determine whether FP tumor morphologies and disease severity are predicted by host species and/or ChHV5 variant identity; and (3) assess paired biological samples for indicators of vertical transmission of ChHV5 in green turtles in Florida, and compare blood health parameters between adult female green turtles with and without evidence of ChHV5 infection. Results: Over the past 30 years, Fibropapillomatosis (FP) has become widespread in green turtles (Chelonia mydas) in Florida, and is also observed in loggerhead turtles (Caretta caretta). Chelonid herpesvirus 5 (ChHV5), the presumed etiologic agent of FP, has been consistently identified in FP tumors via molecular techniques. With this study, we assessed the relationship between FP tumor morphology and ChHV5 DNA quantities in two different sea turtle species in Florida. To accomplish this, we evaluated FP tumor samples taken from green and loggerhead turtles recovered in Florida during 2013-2017. Gross FP tumor morphology was documented, and designated as verrucous or smooth. Half of each sample was analyzed histologically to confirm the FP diagnosis, while the other half was stored frozen prior to further analysis. Genomic DNA was extracted from all tumor samples. Via quantitative polymerase chain reaction (qPCR), ChHV5 DNA loads were quantified in all samples, and qPCR product identity was confirmed using Sanger sequencing. The majority of tumors analyzed were classified as ‘verrucous’, and fewer tumors were classified as ‘smooth’. Tumor morphology was significantly related to turtle species; green turtles were more likely to have verrucous tumors and loggerheads were more likely to have smooth tumors. Tumor scores 2 or 3 were observed in most green turtles evaluated, while tumor score 1 was observed in most loggerheads. Mean viral DNA quantities were compared between the two types of tumor morphologies and the two turtle species, and revealed no significant differences between the four groups. These results support the hypothesis that FP/ChHV5 pathogenesis significantly differs depending on host species, and is less dependent upon viral loads in tumors or viral variant identity.